Fiberglass refers to a group of products made from individual glass fibers combined into a variety of forms. 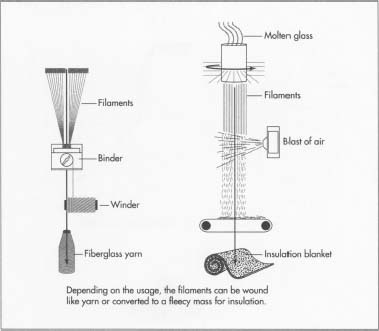 Glass fibers can be divided into two major groups according to their geometry: continuous fibers used in yarns and textiles, and the discontinuous (short) fibers used as batts, blankets, or boards for insulation and filtration. Fiberglass can be formed into yarn much like wool or cotton, and woven into fabric which is sometimes used for draperies. Fiberglass textiles are commonly used as a reinforcement material for molded and laminated plastics. Fiberglass wool, a thick, fluffy material made from discontinuous fibers, is used for thermal insulation and sound absorption. It is commonly found in ship and submarine bulkheads and hulls; automobile engine compartments and body panel liners; in furnaces and air conditioning units; acoustical wall and ceiling panels; and architectural partitions. Fiberglass can be tailored for specific applications such as Type E (electrical), used as electrical insulation tape, textiles and reinforcement; Type C (chemical), which has superior acid resistance, and Type T, for thermal insulation. Though commercial use of glass fiber is relatively recent, artisans created glass strands for decorating goblets and vases during the Renaissance. A French physicist, Rene-Antoine Ferchault de Reaumur, produced textiles decorated with fine glass strands in 1713, and British inventors duplicated the feat in 1822. A British silk weaver made a glass fabric in 1842, and another inventor, Edward Libbey, exhibited a dress woven of glass at the 1893 Columbian Exposition in Chicago. Glass wool, a fluffy mass of discontinuous fiber in random lengths, was first produced in Europe at the turn of the century, using a process that involved drawing fibers from rods horizontally to a revolving drum. Several decades later, a spinning process was developed and patented. Glass fiber insulating material was manufactured in Germany during World War I. Research and development aimed at the industrial production of glass fibers progressed in the United States in the 1930s, under the direction of two major companies, the Owens-Illinois Glass Company and Corning Glass Works. These companies developed a fine, pliable, low-cost glass fiber by drawing molten glass through very fine orifices. In 1938, these two companies merged to form Owens-Corning Fiberglas Corp. Now simply known as Owens-Corning, it has become a $3-billion-a-year company, and is a leader in the fiberglass market. The basic raw materials for fiberglass products are a variety of natural minerals and manufactured chemicals. The major ingredients are silica sand, limestone, and soda ash. Other ingredients may include calcined alumina, borax, feldspar, nepheline syenite, magnesite, and kaolin clay, among others. Silica sand is used as the glass former, and soda ash and limestone help primarily to lower the melting temperature. Other ingredients are used to improve certain properties, such as borax for chemical resistance. Waste glass, also called cullet, is also used as a raw material. The raw materials must be carefully weighed in exact quantities and thoroughly mixed together (called batching) before being melted into glass. 1 Once the batch is prepared, it is fed into a furnace for melting. The furnace may be heated by electricity, fossil fuel, or a combination of the two. Temperature must be precisely controlled to maintain a smooth, steady flow of glass. The molten glass must be kept at a higher temperature (about 2500°F [1371°C]) than other types of glass in order to be formed into fiber. Once the glass becomes molten, it is transferred to the forming equipment via a channel (forehearth) located at the end of the furnace. that forms glass marbles of about 0.62 inch (1.6 cm) in diameter. These marbles allow the glass to be inspected visually for impurities. In both the direct melt and marble melt process, the glass or glass marbles are fed through electrically heated bushings (also called spinnerets). The bushing is made of platinum or metal alloy, with anywhere from 200 to 3,000 very fine orifices. The molten glass passes through the orifices and comes out as fine filaments. 3 A long, continuous fiber can be produced through the continuous-filament process. After the glass flows through the holes in the bushing, multiple strands are caught up on a high-speed winder. The winder revolves at about 2 miles (3 km) a minute, much faster than the rate of flow from the bushings. The tension pulls out the filaments while still molten, forming strands a fraction of the diameter of the openings in the bushing. A chemical binder is applied, which helps keep the fiber from breaking during later processing. The filament is then wound onto tubes. It can now be twisted and plied into yarn. 4 An alternative method is the staplefiber process. As the molten glass flows through the bushings, jets of air rapidly cool the filaments. The turbulent bursts of air also break the filaments into lengths of 8-15 inches (20-38 cm). These filaments fall through a spray of lubricant onto a revolving drum, where they form a thin web. The web is drawn from the drum and pulled into a continuous strand of loosely assembled fibers. This strand can be processed into yarn by the same processes used for wool and cotton. 5 Instead of being formed into yarn, the continuous or long-staple strand may be chopped into short lengths. The strand is mounted on a set of bobbins, called a creel, and pulled through a machine which chops it into short pieces. The chopped fiber is formed into mats to which a binder is added. After curing in an oven, the mat is rolled up. Various weights and thicknesses give products for shingles, built-up roofing, or decorative mats. 6 The rotary or spinner process is used to make glass wool. In this process, molten glass from the furnace flows into a cylindrical container having small holes. As the container spins rapidly, horizontal streams of glass flow out of the holes. The molten glass streams are converted into fibers by a downward blast of air, hot gas, or both. The fibers fall onto a conveyor belt, where they interlace with each other in a fleecy mass. This can be used for insulation, or the wool can be sprayed with a binder, compressed into the desired thickness, and cured in an oven. The heat sets the binder, and the resulting product may be a rigid or semi-rigid board, or a flexible batt. 7 In addition to binders, other coatings are required for fiberglass products. Lubricants are used to reduce fiber abrasion and are either directly sprayed on the fiber or added into the binder. An anti-static composition is also sometimes sprayed onto the surface of fiberglass insulation mats during the cooling step. Cooling air drawn through the mat causes the anti-static agent to penetrate the entire thickness of the mat. The anti-static agent consists of two ingredients—a material that minimizes the generation of static electricity, and a material that serves as a corrosion inhibitor and stabilizer. Sizing is any coating applied to textile fibers in the forming operation, and may contain one or more components (lubricants, binders, or coupling agents). Coupling agents are used on strands that will be used for reinforcing plastics, to strengthen the bond to the reinforced material. Sometimes a finishing operation is required to remove these coatings, or to add another coating. For plastic reinforcements, sizings may be removed with heat or chemicals and a coupling agent applied. For decorative applications, fabrics must be heat treated to remove sizings and to set the weave. Dye base coatings are then applied before dying or printing. 8 Fiberglass products come in a wide variety of shapes, made using several processes. For example, fiberglass pipe insulation is wound onto rod-like forms called mandrels directly from the forming units, prior to curing. The mold forms, in lengths of 3 feet (91 cm) or less, are then cured in an oven. The cured lengths are then de-molded lengthwise, and sawn into specified dimensions. Facings are applied if required, and the product is packaged for shipment. During the production of fiberglass insulation, material is sampled at a number of locations in the process to maintain quality. These locations include: the mixed batch being fed to the electric melter; molten glass from the bushing which feeds the fiberizer; glass fiber coming out of the fiberizer machine; and final cured product emerging from the end of the production line. The bulk glass and fiber samples are analyzed for chemical composition and the presence of flaws using sophisticated chemical analyzers and microscopes. Particle size distribution of the batch material is obtained by passing the material through a number of different sized sieves. The final product is measured for thickness after packaging according to specifications. A change in thickness indicates that glass quality is below the standard. Fiberglass insulation manufacturers also use a variety of standardized test procedures to measure, adjust, and optimize product acoustical resistance, sound absorption, and sound barrier performance. The acoustical properties can be controlled by adjusting such production variables as fiber diameter, bulk density, thickness, and binder content. A similar approach is used to control thermal properties. The fiberglass industry faces some major challenges over the rest of the 1990s and beyond. The number of producers of fiberglass insulation has increased due to American subsidiaries of foreign companies and improvements in productivity by U.S. manufacturers. This has resulted in excess capacity, which the current and perhaps future market cannot accommodate. In addition to excess capacity, other insulation materials will compete. Rock wool has become widely used because of recent process and product improvements. Foam insulation is another alternative to fiberglass in residential walls and commercial roofs. Another competing material is cellulose, which is used in attic insulation. Because of the low demand for insulation due to a soft housing market, consumers are demanding lower prices. This demand is also a result of the continued trend in consolidation of retailers and contractors. In response, the fiberglass insulation industry will have to continue to cut costs in two major areas: energy and environment. More efficient furnaces will have to be used that do not rely on only one source of energy. With landfills reaching maximum capacity, fiberglass manufacturers will have to achieve nearly zero output on solid waste without increasing costs. This will require improving manufacturing processes to reduce waste (for liquid and gas waste as well) and reusing waste wherever possible. Such waste may require reprocessing and remelting before reusing as a raw material. Several manufacturers are already addressing these issues. Aubourg, P.F., C. Crall, J. Hadley, R.D. Kaverman, and D.M. Miller. "Glass Fibers, Ceramics and Glasses," in Engineered Materials Handbook, Vol. 4. ASM International, 1991, pp. 1027-31. McLellan, G.W. and E.B. Shand. Glass Engineering Handbook. McGraw-Hill, 1984. Pfaender, H.G. Schott Guide To Glass. Van Nostrand Reinhold Company, 1983. Tooley, F.V. 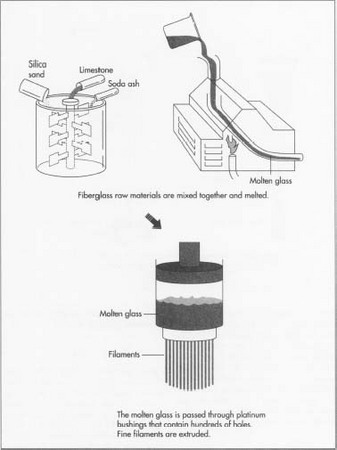 "Fiberglass, Ceramics and Glasses," in Engineered Materials Handbook, Vol. 4. ASM International, 1991, pp. 402-08. Hnat, J.G. "Recycling of Insulation Fiberglass Waste." Glass Production Technology International, Sterling Publications Ltd., pp. 81-84. Webb, R.O. "Major Forces Impacting the Fiberglass Insulation Industry in the 1990s." Ceramic Engineering and Science Proceedings, 1991, pp. 426-31. I'm interested in possibly starting up a fiberglass insulation factory, and am curious as to where I can buy/price equipment. Any leads would be great. is fiberglass danger if the fiber get on hands or thr person breathes in the fumnes from the fiberglass. Kaleb - barriers to entry into manuafacturing are relatively high. Energy cost is high to operate the hot end of the process where the fiberglass is made. Unless you live in an area where electricity is cheap you will not be able to compete. Phylis - some people are allergic to fiberglass fibers however you can easily protect yourself by wearing protective gloves and a dust mask in areas where the fiberglass is being installed. There are no fumes - this material is fiber. Once the insulation is installed - should not be an issue. Some fiberglass insulation has protective layer of film applied to it. Are there alternatives to fiberglass that are Eco-friendly and just as strong? I'm interested in possibly starting up a fiberglass resin and other product such as complete plant , and am curious as to where I can buy/price equipment. Any leads would be great. Lot of things U given. Is fiberglass particles used in laundry detergent as optical brightness ?